to Julius Caesar on the Ides of March? The terrible tidings and twisted tale of corruption, betrayal, and the quest for absolute power – no, not Washington DC -- Rome circa 44 B.C. 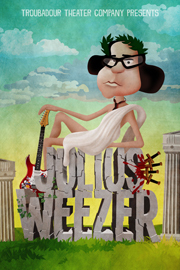 Shakespeare’s story of Caesar, with the funk-rock riffs of the resurgent and ubiquitous band, weezer. This 90-minute hard-driving, heart pounding, adrenaline rush of a show will feature the Troubies in all their classical glory – speaking the speech, and strumming the power chords. The production will take advantage of the El Portal’s wonderfully theatricalized confines to create a bloody, bold, and resolute retelling of one of Shakespeare’s great tragedies. Part circus, part improv comedy show, part rock concert - with a live 4-piece band that complements and compels the cast of 12 Troubies as they wind their way through the dark and dangerous world of Julius weezer.